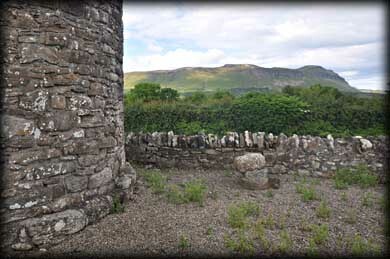 Located o n the west side of the road which now disects the former monastic site at Drumcliffe is the remains of Sligo's only Round Tower which dates to the 10th/11th Century. It is recorded that Lightning struck the tower in 1396, and that much of the tower was plundered in the 18th-19th century to build a nearby bridge. 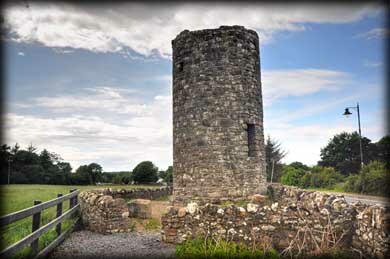 Petrie, in the mid 19th century, drew the tower with a shack at its base and a window remnant at the top of the tower to the southeast. The tower stands about 9 metres from ground level with the ESE-facing doorway about 2 meters above ground level. One small lintelled window survives on the second floor level. Situated: Easy. Nestled below Benbulben in County Sligo, approximately 12 kilometres north of Sligo town on the N15. 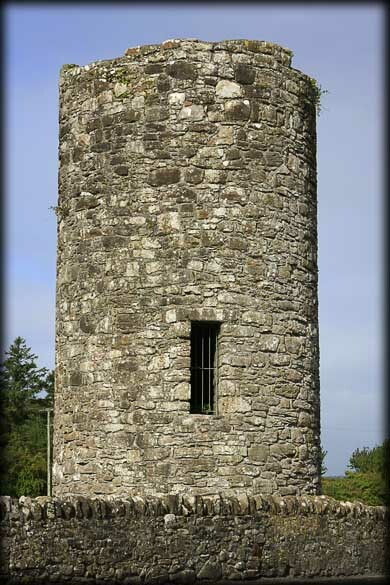 The Tower is on the west side of the road facing Drumcliffe church.